What does otocheck immo tool can do? 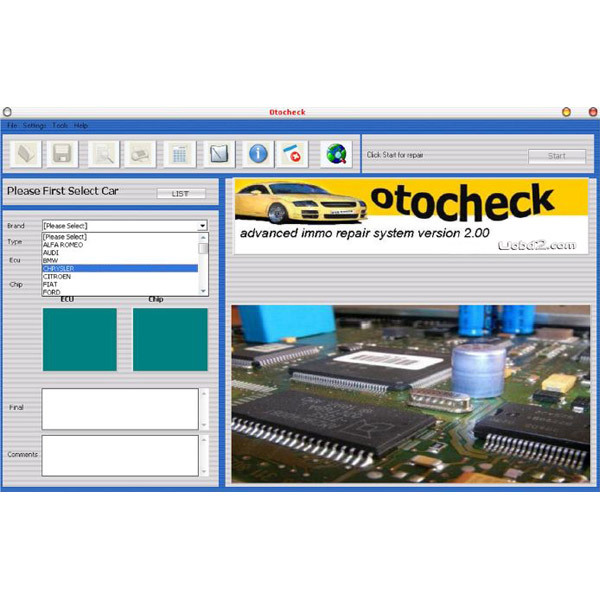 Otocheck is an advanced Immobilizer repair tool used to repair immobilizer problems in vehicles with faulty ECU's or immo boxes or in situation where all keys have been lost. It can also be used for track cars where a donor engine has been used or an ECU swap out. This is an advanced tool with a comprehensive coverage for all lock smiths and ECU repair stations worldwide. In Order to repair an immobilizer problem, we first need to read the chip that stores the immobilizer data. This is normally in the form of an 8 pin Eprom found in the ECU or immobilizer box located behind the dash.If you are unsure of the location or chip type you can select the make/model before starting in order to identify the chip/location in question. Once identified you will need to read the chip with your own programmer. For Eproms we recommend SeeProg by Elnec and for a wider chip coverage UPA USB by elrasoft which will cover many MCU processors. After reading the chip save a copy to your machine (also make a backup) to load into the software. You will receive the software with an activation Key. The software will run on any Laptop/PC running XP or win2000. Updates will be provided when available for a small fee. When you buy the Otocheck from our website, we will provide a software link to you. You can downlaod the software, then unzip the software on a new folder on your computer desk. After you unzip the software, pleaser operate the file"PsaCalculator-HWID.exe" on the software categary, and you will get an ID number like Hardware fingerprint:085E-76AD, please send the ID number back to us.Then we will send the password to you,and you can use it. Tips: You need to install the software on English system, and also close the anti-virus software.